Lovely Petite Tuxedo GirlScarlett was rescued from a deli basement in Ditmas Park. 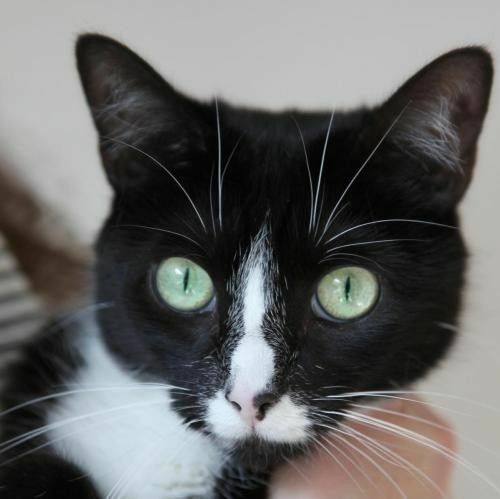 She's an adorable small tuxedo girl with enormous green eyes and soft fur. She is quite affectionate and helps her foster mother study by napping at her side or in her lap. She can also be independent; like her namesake, Scarlett is her own woman. Scarlett is often playful and active, especially in the evenings. She loves warm places and napping in her basket. Possibly because of her previous isolation and poor treatment, Scarlett is nervous of loud noises and loud people and would do best in a quiet home with someone who can give her love and attention. She's the perfect lap cat companion! Scarlett would prefer to be a single girl, but she can tolerate other laidback cats who give her space. She is approximately six years old, spayed, fully vaccinated, FIV/FeLV negative, and microchipped.